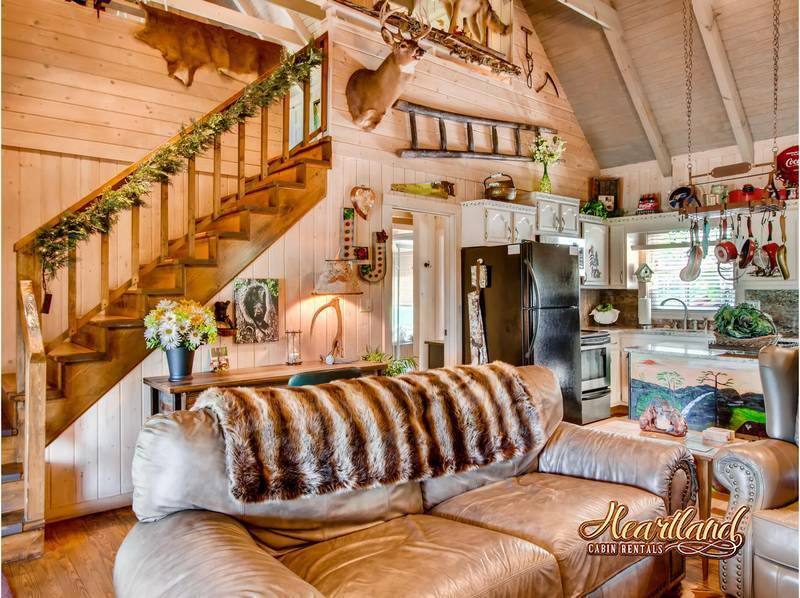 LJ's Cozy Getaway is a unique cabin featuring a year-round Christmas Loft. Follow the lighted handrail staircase to the loft and flip the "Santa's light switch" and all of the Christmas lighting comes alive! 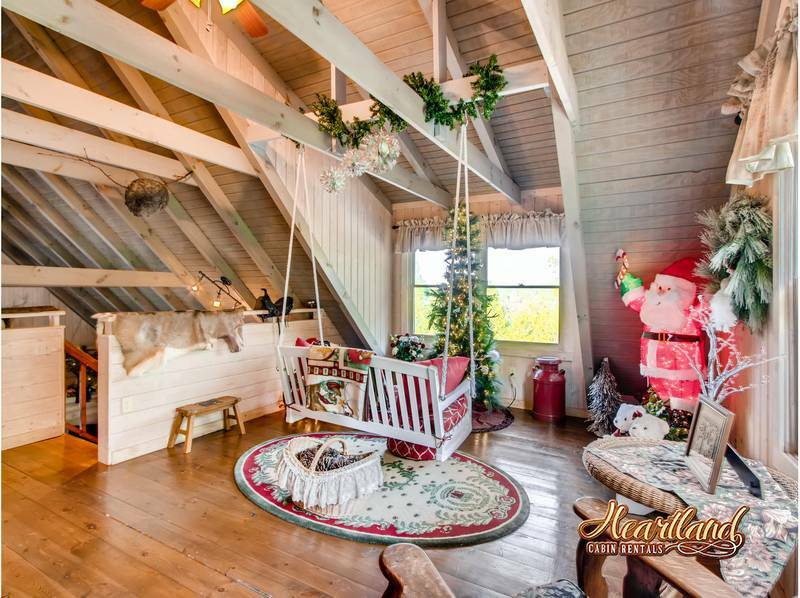 Swing away all year long in the Christmas Loft while enjoying the great views. 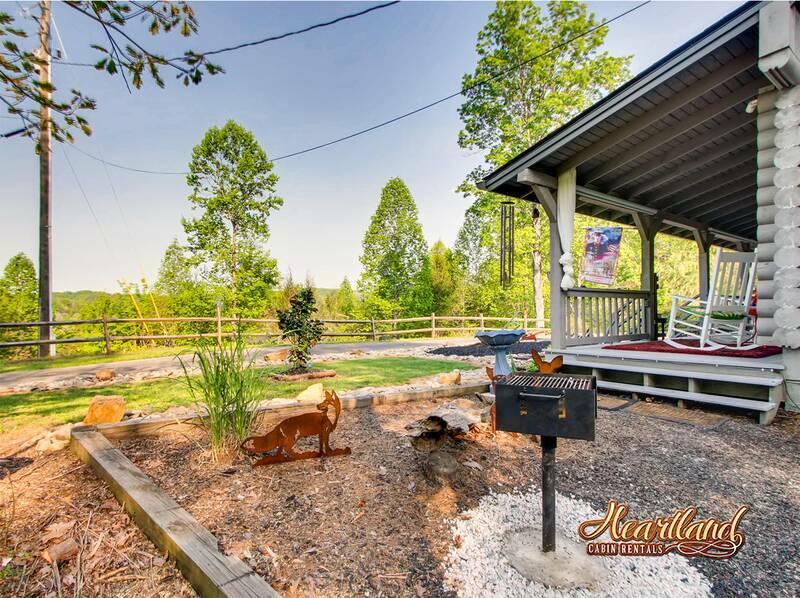 LJ's Cozy Getaway is situated on 2 acres with all paved roads leading to the cabin. 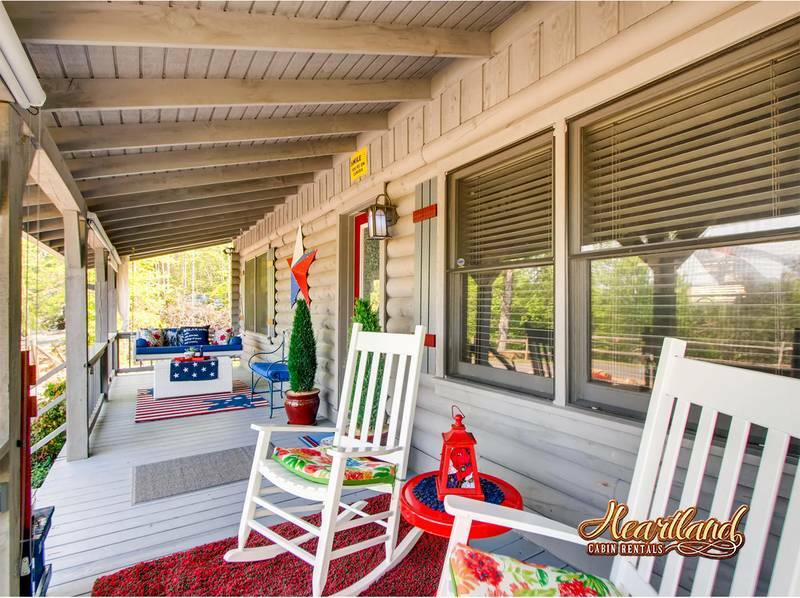 The "Southern Porch" welcomes you with rocking chairs, a bed swing, sun screen blinds and plantation sheers relinquishing a calm to enjoy the breathtaking sunrise with a great view plus everything of outdoor LED Lighting. 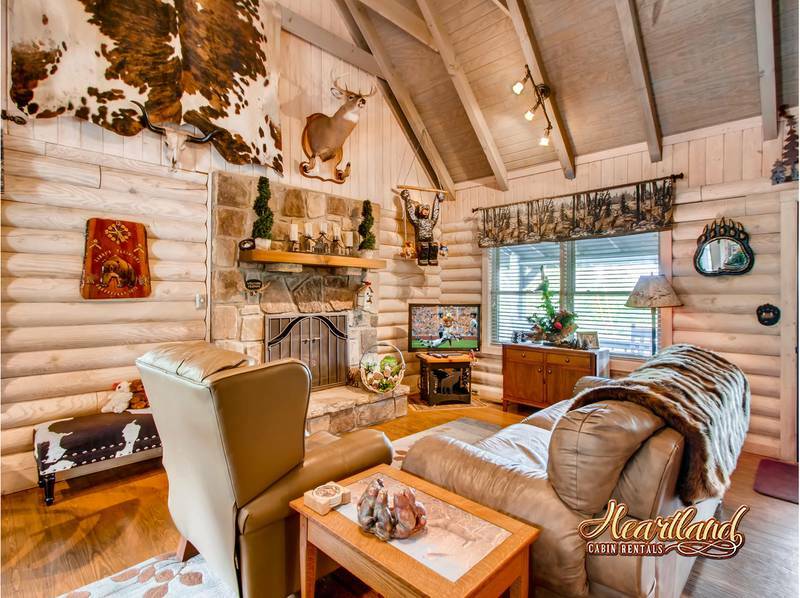 Upon entering your Smoky Mountain Getaway, an atmosphere of round logs, soaring ceilings, a flagstone gas fireplace with stunning decor surrounds you. Enter the king size master suite accompanied with a luxury two person rain shower spa. Additional options are led lighting, body and foot massages and while enjoying your body and foot massage there is a radio to enjoy your favorite tunes. 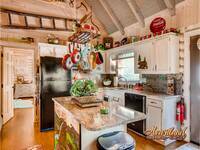 Fully equipped kitchen is provided so you can prepare and enjoy your favorite meals. Mr. Coffee and a Keurig Coffee makers. All granite tops, a Jack Daniels No 7 barrel along with the most comfortable and stylish Jack Daniels bar stools. 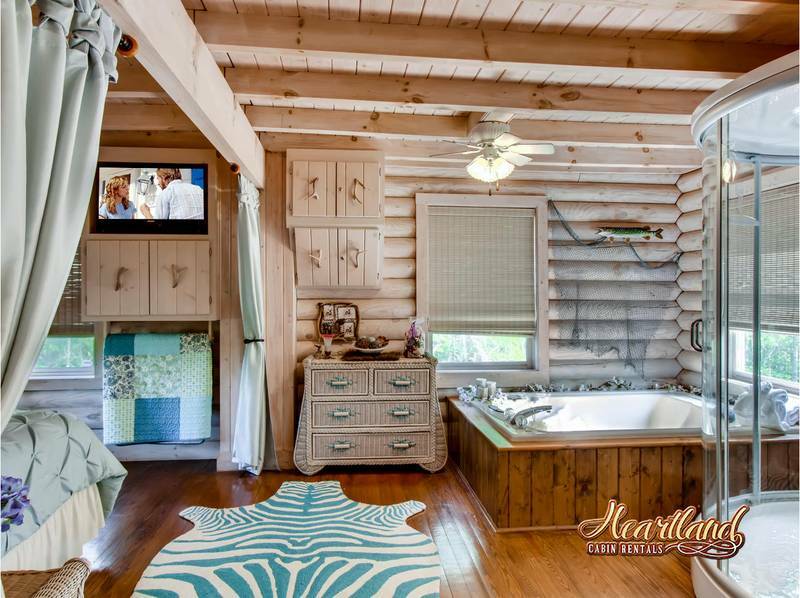 The rear private deck has the hot tub under the cabana. 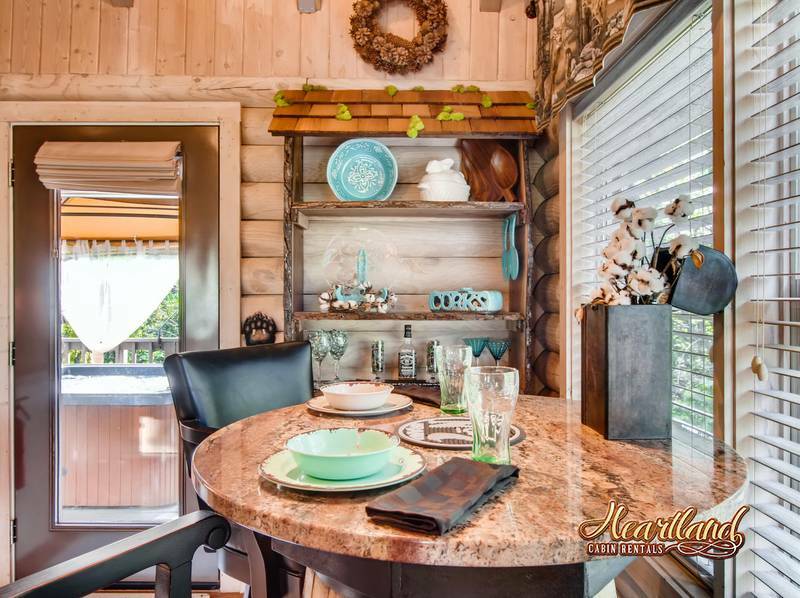 Relax and enjoy the many personal touches made to this cabin by the owners. 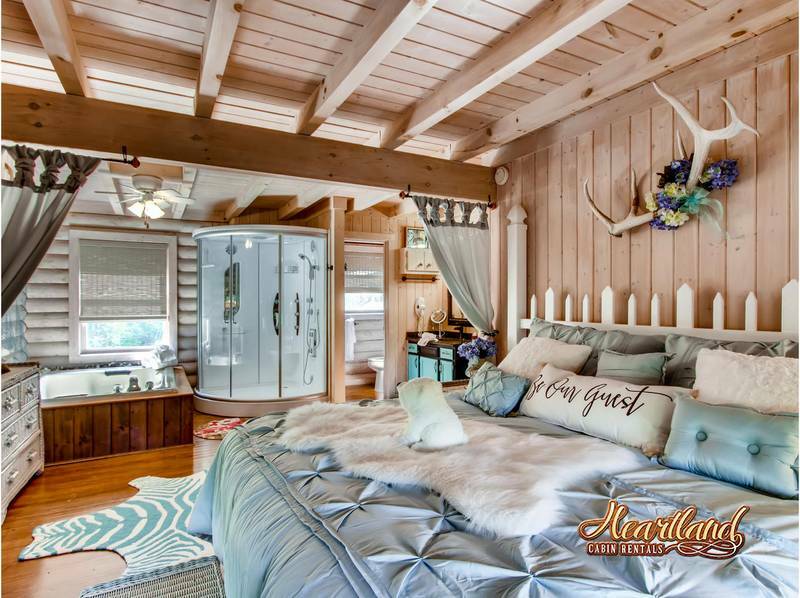 So familiar to the many details also found in the sister cabins Dolly Bear and Aspen's Hideaway! 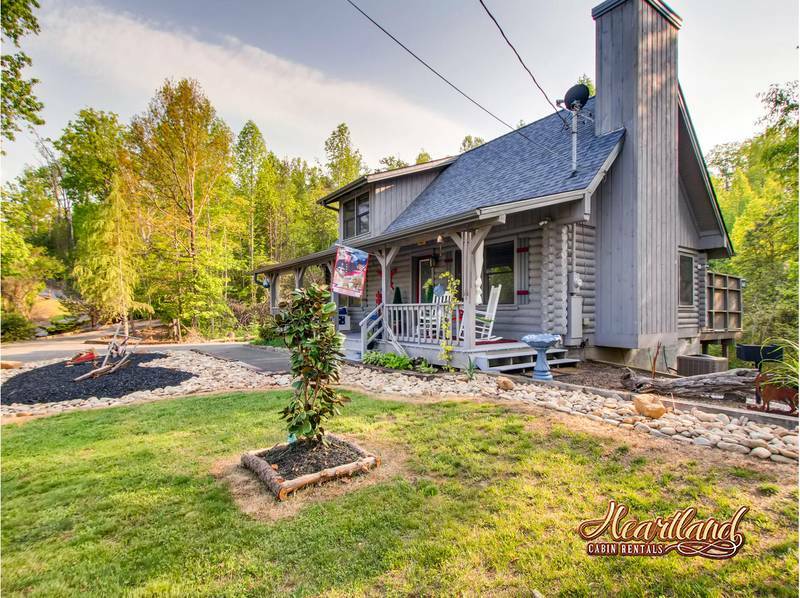 LJ's Cozy Getaway is the best cabin we've ever stayed in. LJ's is decorated nicely. The cabin owners have left out no details. 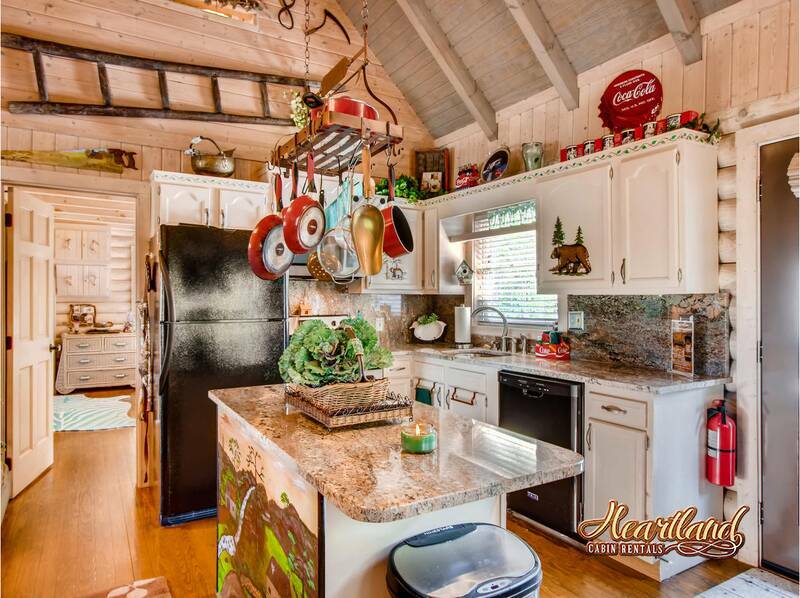 The cabin is clean and stocked with any kitchen utensil you may need for your stay. 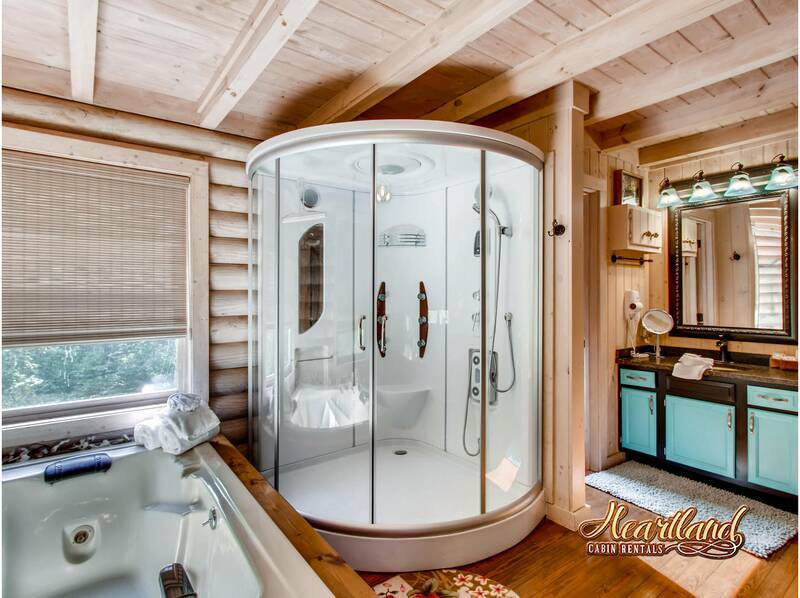 Loved the shower and huge garden tub. We'll definitely be back!!! The cabin was excellent. It was completely decorated from top to bottom and the owners provided extra appliances and cooking utensils that made it a really easy to make food at the cabin whenever we wanted. The bed was extremely comfortable and it was huge. A really great experience. I was very impressed with this cabin. It was secluded on the mountain however very easy access to Gatlinburg and Pigeon Forge. No cell service for us, but it was a welcome detachment. Also, Heartland made everything so easy and I will probably never rent from another company again! 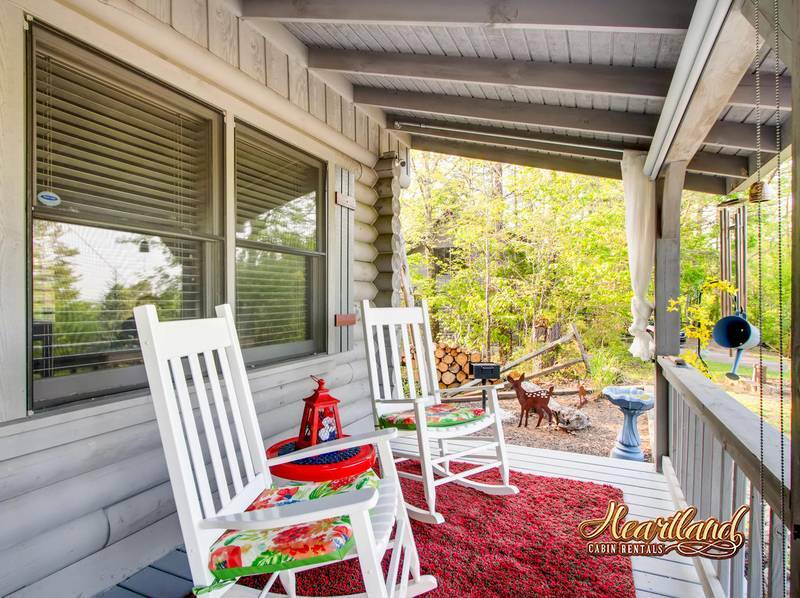 LJ's Cozy Hideaway quaint and homey feel make you comfortable the moment you walk in. Loved this little cabin. We loved all of the homey touches and unique eclectic decor. Next to Aspen's Hideaway, this is one of the homier cabins. We loved it. The cabin was exactly as advertised. This is one of the nicest cabins we have rented. It was very clean and cozy. I would definitely come back. Our stay was wonderful and we can't wait to come back and stay again. Our stay at LJ's Cozy Cabin was amazing! The cabin was clean and filled with everything we needed. The convenience of having a washer and dryer was nice. 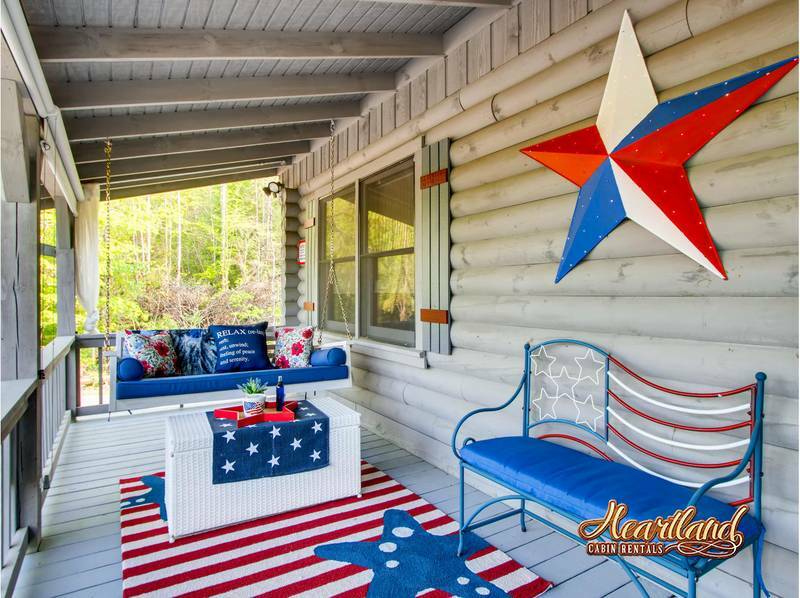 Heartland Cabin Rentals were super easy to work with. Everyone I spoke with was knowledgeable, friendly and professional. I especially appreciated being asked to call the office once we reached our cabin to let them know we made it in. Advice to anyone renting a secluded cabin such as us: follow Heartland directions and try and arrive in the daylight. We live out in the country and still found the back roads difficult to navigate for the first time after dark. We will definitely use Heartland rentals for any future visits. My husband and I stayed here for 3 nights for our anniversary! Loved the rustic look! So homey and cozy! Not far at all from all the attractions. Pretty much in the middle so easy access to all the local cities. With heartland rentals they gave us one free ticket for a lot of shows and places to go. Since I scheduled 5 shows I got a discount on every one of them and only had to pay like 20 dollars a ticket! What an amazing price!!! Usually these shows are like 40-60 dollars a person. 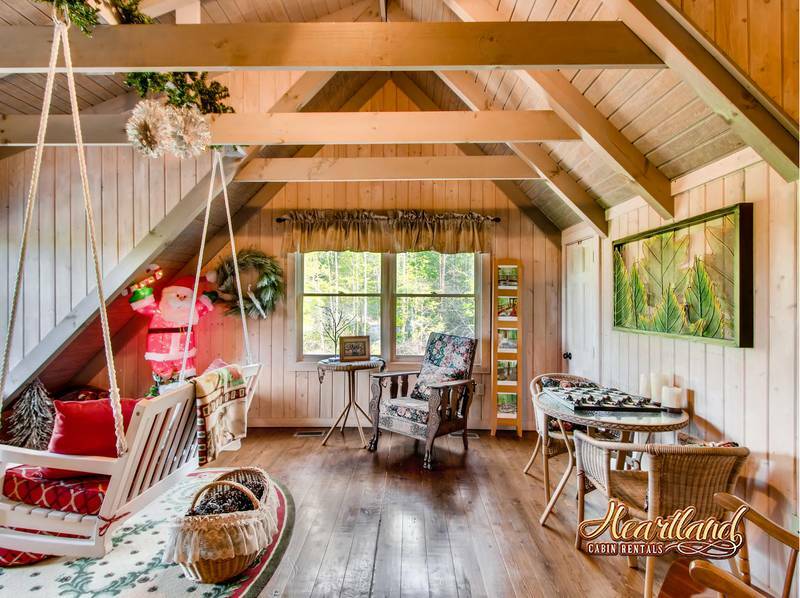 The swing in the loft was so wonderful and adorable looking out the windows in the mornings drinking my coffee. Bed was a little too hard, but nothing the shower massager couldn’t help with! Foot and back massage in the shower! Next time we come back we will be coming back to this cabin!!! Upon arriving the owners even left us a cute little gift to welcome us! How thoughtful! 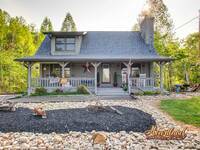 If ever you’d like to sell this cabin please contact me because i would love to buy it!! Thank you so much for letting us stay here! 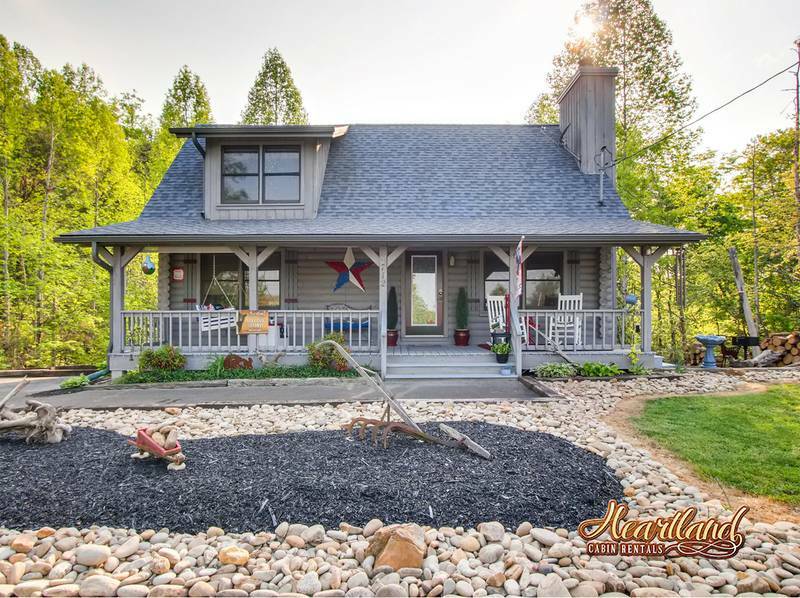 It’s just the perfect getaway for two parents of 4 Little Kids! We had a wonderful week! 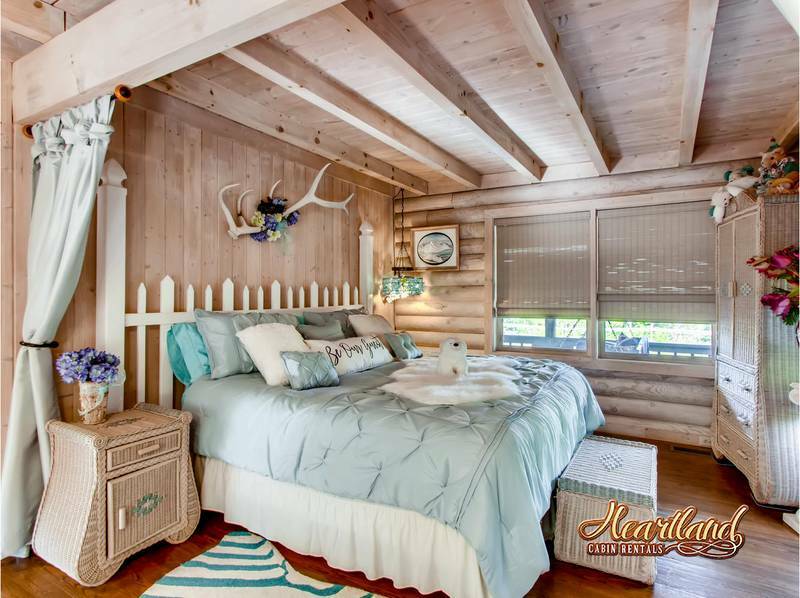 The cabin is cozy and comfortable. It has all the amenities of home. The only suggestion I have is maybe the addition of a ceiling fan over the bed. That side gets a little stuffy at night. Other than that, it was a great week and we will be back! Very nice cabin with great homey feel. Very clean and well kept maintenance wise. Only about ten minutes from pigeon forge. Everything was good. The silverware is starting to tarnish a little, but other than that it was amazing. We plan to book the cabin every year. 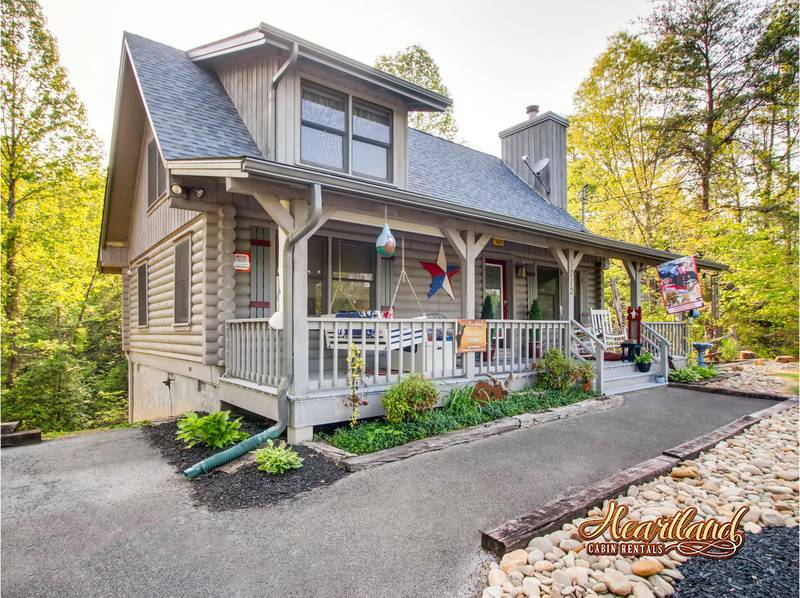 Cabin was amazing and located between Gatlinburg and Pigeon Forge. The adventure pass was a money saver. The cabin was clean and had a great view. We will be back. Beautiful, perfect place for a honeymoon! We got married on a Saturday evening, so we had to do late check in. The directions were very easy to follow and we were able to get to the cabin with ease! Everything was beautiful. This is such an updated, modern cabin, and it was perfect. We loved the two person jacuzzi bathtub, and the shower was nice too! The kitchen had everything we needed to cook a full meal, and it was so cozy! The upstairs was adorable, and we loved the swing and the view! The cabin was easily accessible, and absolutely wonderful. We used the fun pass and especially loved the aquarium, so neat! I could go on and on. We plan to come back yearly around the time of our anniversary for a perfect getaway! We left feeling even more in love! Thank you for everything! My first trip staying in a cabin was OUTSTANDING! I loved everything about LJs Cozy Getaway. The property was perfect size! We came as birthday trip for my boyfriend! 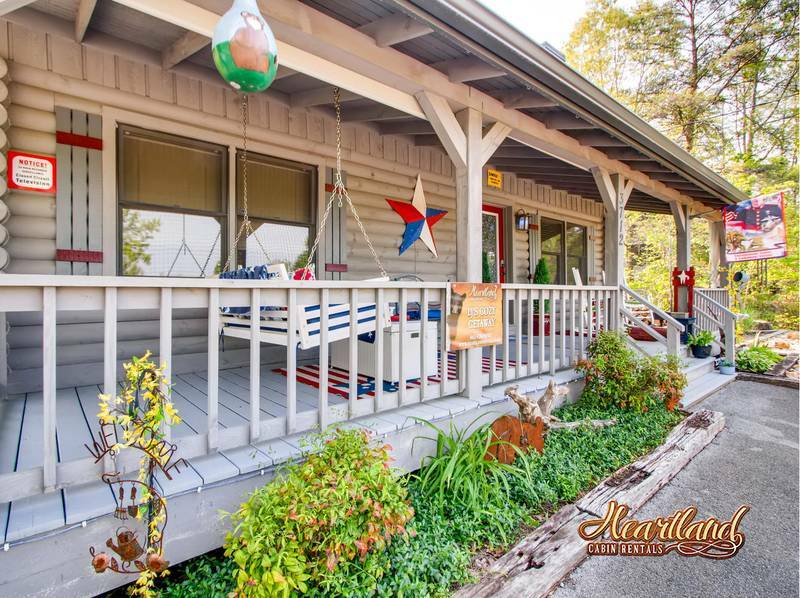 The staff were so helpful, the cabin is fully equipped for anyone to have a great time! The hot tub topped it off with a cherry on top! Perfect getaway from hustle and bustle of surrounding area. LJ's Cozy Getaway was one of the nicest cabins we have stayed in. It was everything the on-line summary said it was and more. Lots of attention to the little details. It was clean and very well stocked. 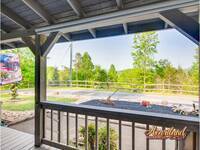 Loved the views from the front porch. Close enough to Gatlinburg and Pigeon Forge to visit whenever we wanted but very private and quiet to return to. 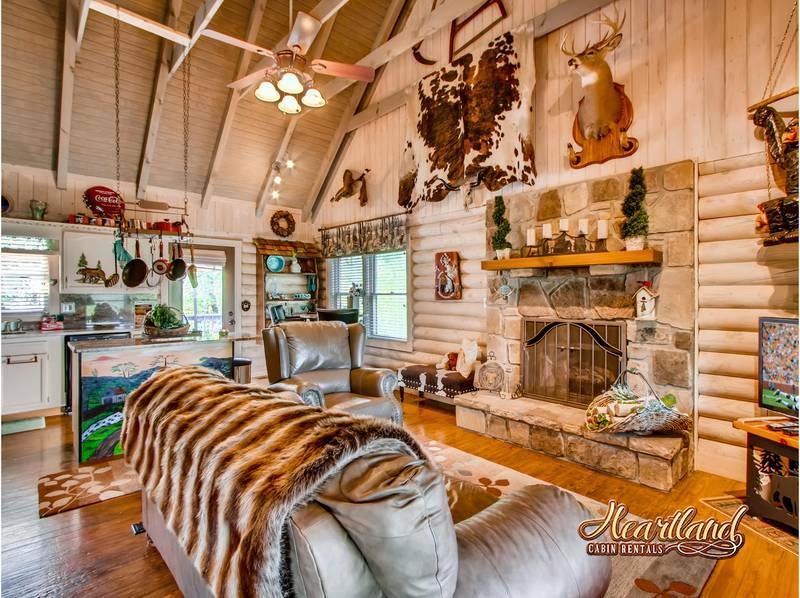 This cabin is a great tribute to its owners. We had to cut our visit short due to a death in the family and were very sad to leave. 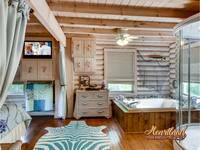 Seldom does the selection of a cabin occur that all pictures and amenities listed are facts, but I can honestly state LJ's Cozy Getaway was exactly as stateted and shown!! Upon arriving and entering the cabin it was even better then I expected. Everything was top of the line. King size mattress were awesome, bedroom combined with rain-spa shower, jacuzzi tub was spacious. Hubby loved the radio in the two person shower. The house is beyond adorable! The owners did not overlook a single detail from light switch covers to choice in throw blankets! 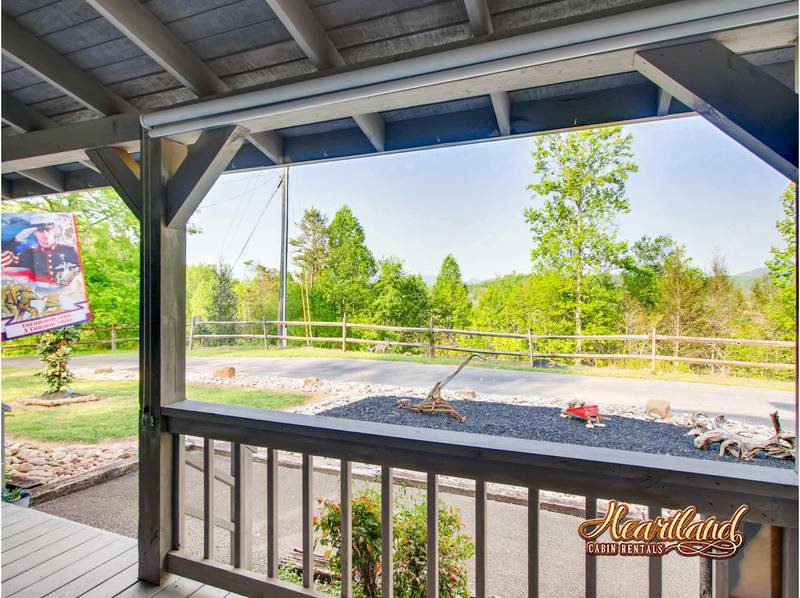 It is a nice distance from the busy downtown and offers a great view of the mountains.